Labour's vice chair of faith groups, Stephen Timms MP, reports on the persecution of Christians in Iran by the regime. Together with Joe Benton, Labour MP for Bootle, I visited Turkey in August as guest of Elam Ministries. Elam is a well-resourced, UK-based charity which supports Iranian Christians.Our visit contributed evidence for the Christians in Parliament report on the persecution of Christians in Iran, published subsequently in October. Iran has a population of 74 million. Nobody knows how many are Christians, but the number appears to be growing fast. Some think it could be as high as 1.5 million. But, along with other religious minorities such as Baha’i, Christians in Iran face severe persecution. We visited Istanbul, where there is a lively Iranian church, and visiting Iranians are offered New Testaments. The people involved told us they are hardly ever refused, and many Iranians are keen to discuss what the New Testament says. Deep disillusion is common with the version of Islam proclaimed by their own government, and with the experience of living under a regime which adheres to it. We also visited Kayseri, a big and modern Turkish city of around a million people, with an ancient fortress at its centre. In the winter it is a popular ski resort. We visited an Iranian church there, one of numerous churches of Iranian exiles across Turkey. It meets in a modest flat at the top of a low rise block above shops. There was a congregation of 50 when we visited on a Sunday morning in August. It was lively and informal, with choruses, readings and a sermon. There was a wide age range, including children. They have had to stop their evangelism, because they can’t fit any more people in. To begin with, after the Islamic revolution in Iran in 1979, the regime was tolerant of Christians and other minority religions, who are protected under the Iranian constitution. There is a registration system for non-Muslim places of worship. But subsequently a campaign of persecution against religious minorities began. Persecution has been stepped up recently. Many of the Christians we met knew Farshid Fathi, an Iranian pastor with a young family who has been serving a six-year prison sentence since December 2010. Officially recognised churches face tight restrictions. With few exceptions, churches can no longer hold services in Farsi, the first language of most Iranian Christians. Services are not allowed on Friday, the official day off, so going to church may well involve taking time off work, and giving up half a day’s pay. Christians who attend services are closely monitored. Churches have to submit lists of members with their identity card numbers, so church-goers can be easily traced. Recognised churches find it increasingly hard to obtain permission for maintenance work on their buildings. The regime has retaliated against the growth of Christianity with a concerted propaganda campaign. It is strictly forbidden for Christians to share their faith with Muslims. Churches that reach out to non-Christians have had leaders executed, and members imprisoned and tortured. Congregations live under constant threat of arrest and violent interrogation. We were told the harshness of the regime is in stark contrast to the warmth and tolerance of the people. Iranians are proud of their rich history of poetry and literature. 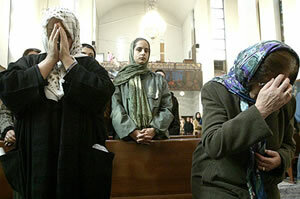 Despite persecution, the Iranian church is growing fast. Iranian Christians we met in Turkey said the regime’s propaganda against Christians is widely disbelieved. In Istanbul, we met two young men, Farhad and Natan. They had become Christians in Iran, and joined a church. Natan became a Christian because he read a New Testament given to him by a young woman who lived next door. I asked if he had discussed it with her. He pointed out he couldn’t – as a bachelor, it would have been improper for him to have long conversations with her. One day in 2011, Farhad and Natan went by motorbike to give out New Testaments in a village. A police car gave chase, the officers drawing a gun at one point. Trying to escape on their motorbike, they crashed and were injured. They were taken into police custody, and had no medical treatment at all for a week. They were in prison for six weeks, part in solitary confinement, then released on bail. Natan decided to flee the country. Hearing this, the same night, Farhad decided he had to leave too. Natan was able to get to the border with Turkey and cross as an ordinary traveller. Leaving later, Farhad didn’t have time to get to the Turkish border that night. Instead he went into Georgia, whose border was nearer, with help from a smuggler he found on the internet. We met a lot of remarkable Christians. In Kayseri, we met Matthew, who described his arrest – alongside his wife, who was also imprisoned for a period – on a charge of “action against the security of the nation”, which can carry a six-year sentence. He was in prison with Farshid Fathi. His imprisonment lasted three months, including a month in solitary confinement. Later he was in a cell with ten others, including a journalist, an academic and other professionals, who shared a shower and toilet between them. On release, he fled to Turkey. His mother in law, who put up her house deeds as bail for him, was going to have to return to the police station shortly and was expected to have to forfeit her home. One of the Iranian Christians we met in Istanbul told us of visiting a small village where all the residents had become Christians – probably through watching a satellite TV broadcast. He met a nomadic family of seven people there who told him that, not long previously, as they did every year, they arrived at the village to rent a field and farm their animals for a season. They soon noticed something had changed. For a start, they were charged much less rent than usual, and for the first time they were given access to the landowner’s well. They found out these changes were because the landowner had become a Christian. The upshot was this family came to faith too. Only one of the seven, a young girl, can read. So, every night, when they strike camp, she reads the Bible to them and the family prays together. We met many who had suffered for their faith in Iran – in some cases suffered terribly – but they hadn’t given up. Instead, they appeared to be even more determined to tell their fellow countrymen what they believed. The current UK government has – rightly – assigned a high priority among its foreign policy concerns to freedom of religion or belief (FoRB). Labour in government must also prioritise this most basic of freedoms, and protect and advance it. A Labour foreign secretary should raise with overseas governments’ cases of apparent impunity for those who violate religious freedom, in contravention of the law or even, as in Iran, the constitution; and the need for the authorities to protect those who defend religious freedom. Ministers on overseas visits should make a point of meeting with religious minorities. Visits like that are a source of great encouragement for groups being persecuted, and make it harder for governments to cover up what is happening.